Best Dividend Stocks: Is Linn Energy Better for Your Portfolio Than ExxonMobil? High-yielding Linn Energy will give you more income than Exxon Mobil; but that doesn't mean it's right for your portfolio. If you're looking for income from your energy investments, Linn Energy LLC (NASDAQOTH:LINEQ) is most likely on your radar screen. While a 10%-plus yield is tempting, you have to ask yourself if owning high-yielding Linn Energy is a better call than buying an industry stalwart like ExxonMobil Corporation (NYSE:XOM), even though its yield is just approximately 3%. While Exxon has been struggling to increase production in recent years, Linn, like most international oil and gas companies, increased production 44% year over year in the second quarter. Exxon's production decreased in the low single digits. Linn's massive production increase came through acquisitions and asset swaps, so it's not like Linn is suddenly finding 40% more oil and gas on its land. But, thanks to the benefit of starting with a smaller base, Linn can achieve such results. Linn's production was 1.13 billion cubic feet equivalent per day in the second quarter. Basically, that takes all of the company's production, oil, gas, and natural gas liquids, and treats it as if it were natural gas. Exxon produced 10.7 billion cubic feet of natural gas a day in the second quarter and more than two billion barrels of oil a day. These companies are on opposite ends of the size spectrum, which is why Linn can more easily move the production needle. Linn is also a U.S.-focused business, which limits geopolitical risk. Exxon has deals around the world, which can create problems. For example, the oil giant recently had to halt drilling activities with Russian partners in that country's deep arctic waters because of the Ukraine crisis. This highlights the problem Exxon has finding meaningful new reserves by emphasizing that it has been forced to work in increasingly inhospitable locations both physically and politically. Linn has a higher yield, better growth prospects, and "safer" production profile than Exxon; so far, it sounds like Linn is a better choice. But there's more to consider. For example, Linn's debt-to-equity ratio was nearly 1.9 at the end of the second quarter. That compares to Exxon's debt-to-equity ratio of around 0.07. If you're concerned about lean times, Exxon's staying power is much greater. The recent drop in oil prices highlights this risk, because dropping commodity prices means lower revenues. However, Linn makes extensive use of hedging to soften the blow of volatile prices. 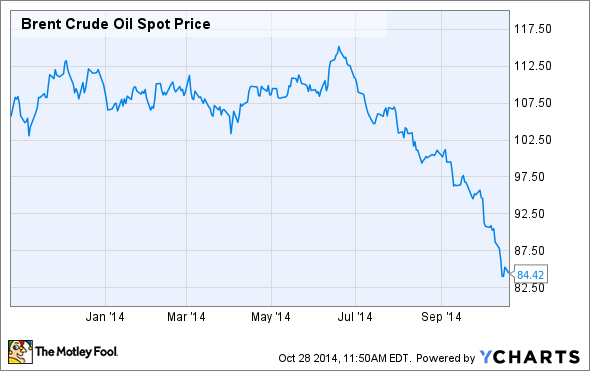 Right now, it has all of its oil for the year locked in at prices in the $90 range. About half of 2015 and 2016 oil production is hedged at those levels, too. That will help protect Linn's revenues and dividends over the near term. But if international oil prices stay in the low $80-per-barrel area, or fall further, those hedges will start to look like a cliff. Once the hedges roll off, realized prices will fall quickly, and future hedges will be at lower levels. While Exxon will feel the pain of falling oil prices, too, low debt will minimize the financial risk. Let's get back to dividends. Linn is a limited liability company, roughly similar to a limited partnership in that it focuses on passing as much cash flow as possible to shareholders -- virtually all of it, in fact. The company's second-quarter earnings release highlights that it covered its distribution with cash to spare, but came up slightly short in the year-ago period. If the top line falls during an extended period, and debt payments call, the dividend is going to get trimmed. Exxon's payout ratio, meanwhile, is just about a third of earnings, leaving plenty of room for top-line weakness. Then there's diversification. Linn just drills. Exxon drills, refines, has a large chemical operation, and sells gas, all on a global scale. If one area is weak, other areas are there to pick up the slack. It doesn't mean Exxon won't feel any pain; but, like Linn's hedges, Exxon's business diversification helps soften the blow of hard times. Ultimately, the question of Exxon or Linn boils down to risk. If you're willing to take on the risk of falling energy prices leading to a dividend cut, Linn is probably more appropriate for you. If oil prices bounce back, you win. If not, a distribution cut could lead to a swift share price decline. If you would prefer a lower-risk income stream, Exxon is the better option. In fact, Exxon has increased its dividend for more than 30 years, showing just how stable a ship it is, even when oil prices and stock markets are volatile.